War for the Planet of the Apes is the third movie in the Planet of the Apes trilogy. After a virus wiped out most humans and made apes more intelligent, the few humans left (led by a colonel played by Woody Harrelson), are in a war with the apes that will determine the course of humanity. 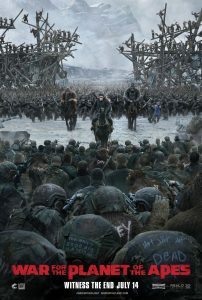 After the apes suffer an awful loss, Caesar (Andy Serkis), the leader of the apes, goes on a quest for revenge. War for the Planet of the Apes in an excellent, groundbreaking film that is fantastic in just about every aspect. The cinematography in War is flawless. This film is gorgeous to look at. Each shot not only serves a purpose, but is always amazing to look at. I really can’t emphasize this enough. Certain scenes featuring snow are just so…pretty and well-shot. The visual effects here contain some of the best CGI ever put to screen. All of the apes are SO realistic, and it’s impossible to tell that they’re rendered on a computer. They look exactly like real apes. Additionally, all of the environmental effects are fantastic. For example, the scenes that take place in the woods and feature snow all look spectacular. The sound design in War is really great as well. It shines both in quieter moments and louder, bigger scenes. All the characters in this movie have unique, flawed personalities. Caesar in particular has lots of development and is a very complex character. During the film, he is forced to deal with a lot of internal, moral conflict as he struggles with becoming more and more like the evil ape Koba, who he defeated in Dawn of the Planet of the Apes. Woody Harrelson’s character, who I’ll touch on more later, isn’t a flat-out bad guy: he has depth and motivations. You see why he’s doing what he’s doing. All of the humans are also believably motivated- they’re just scared people that want to survive. Both the motion-capture and live-action actors in War give great performances, but a definite standout is Andy Serkis. He gives an Oscar-worthy performance and shows so much emotion and conflict, just through motion-capture. Woody Harrelson provides a wonderful portrayal of The Colonel that depicts the character’s motivations quite believably. Steve Zahn plays Bad Ape, who provides comic relief. He’s great in the role and really brightens up the film, but more on that later. Matt Reeves masterfully directed War for the Planet of the Apes. The film is brutal and bleak, yet never too dark. Reeves made a movie of both spectacle and emotion, and it weaves between those two seamlessly. Again, the flick can get quite grim, but it always maintains a feeling of hope: Reeves nails the tone. The movie isn’t devoid of humor, either. Steve Zahn’s Bad Ape, as I said before, is quite funny. He lightens up the film when it needs some levity, but is never overused or annoying. The plot of War is great. It takes risks and is quite compelling. The story gets you to care about the characters and is smartly written. The stakes really help you understand how important the war is and invest you deeper into the storyline. The film’s not short on heart, by any means. There are many excellent emotionally charged scenes that further the motivation of the characters, and the audience’s caring about the movie. Michael Giacchino has been on fire recently: first, he had the great score for Spider-Man: Homecoming, and now this! The score here is truly brilliant and manages to evoke emotion in the audience. At times, it’s triumphant; at others, its fear-inducing. Nonetheless, it is a spectacular score, and the movie’s worth watching for it alone. Although War is long, it certainly doesn’t feel it. The pacing is done well, and the movie’s never boring. Even the quiet, soft moments are entertaining (to say the least) and not boring at all. Honestly, there’s nothing to complain about here. War for the Planet of the Apes is a masterpiece. However, and this is NOT a problem, but should be known before viewing, the movie isn’t necessarily about the titular “war”. It’s more contemplative and thoughtful than just a compilation of action sequences. There is action in it, and when it comes, it comes big, but the film’s not totally about war. Overall, War for the Planet of the Apes is a masterpiece. It excels everywhere, but especially in its stunning cinematography and effects, wonderful score, and amazing performances by its cast. That’s really awesome. I hope to see this soon.